Moose are perhaps one of the most iconic Adirondack animals, easily recognized by their towering form and sprawling antlers (a feature of males only). National Geographic reports that these mammals can be over six feet tall from hoof to shoulder and can weigh more than half a ton. The span from one end of a male's antlers to the other can reach a whopping six feet! Although it may seem like such a large animal would have no problem ruling its territory, moose are only just beginning to repopulate the region after multiple factors threatened their existence. In the 1800s, hunting in the Adirondacks was unregulated, so naturally hunters sought to bring down the largest animals they could. In addition, massive deforestation eliminated moose habitats and forced the species from the region in the 1860s. 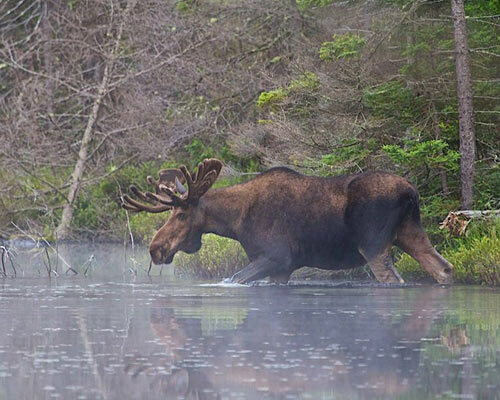 It wasn't until more than one hundred years later in the 1980s and 90s that moose sightings in the Adirondacks were once again documented by the Department of Environmental Conservation. In the early 1990s, the DEC took a great interest in protecting the species and increasing its numbers in the region, and these efforts eventually boosted the population to an estimated 500-800 moose in 2010. Deforestation and over-hunting are no longer pressing concerns (killing a moose is a misdemeanor in New York State), but a very tiny parasite is seriously threatening the progress that has been made on the moose repopulation front. Winter ticks have been especially problematic in recent years, and experts believe that climate change and the increased population density of moose in the Adirondacks could both be contributing to the problem. Tens of thousands of ticks can latch onto each moose, and the parasites have been killing the animals in Maine, New Hampshire, Vermont, and other regions of the US and Canada. Research is currently being conducted to assess the exact number of moose currently living in the region so a plan can be made for protecting the health of the species. The moose is the largest species in the deer family and the largest land mammal in all of New York State. Moose generally move very leisurely and don't spook easily, but they can move quickly when necessary, usually out of fear or anger. An adult male is called a bull moose. An adult female is called a cow. A young moose is called a calf. Only bull moose (males) grow antlers. Moose are "herbivores" (they eat only plants). From foot to shoulder, the moose can measure over 6 feet tall! Moose are most active at dusk and dawn. Adirondack moose sightings occur more often in the fall, which is the animals' mating season, and bull moose battle over females.